I am a bona fide Converse™ sneaker fanatic. Yesterday I bought my 8th pair…hey, they were on sale! Because I know I have a problem (and I’m running out of space in my shoe rack) I’m donating two older pairs to make room for my newest addition–Ultramarine. Aren’t they cute? 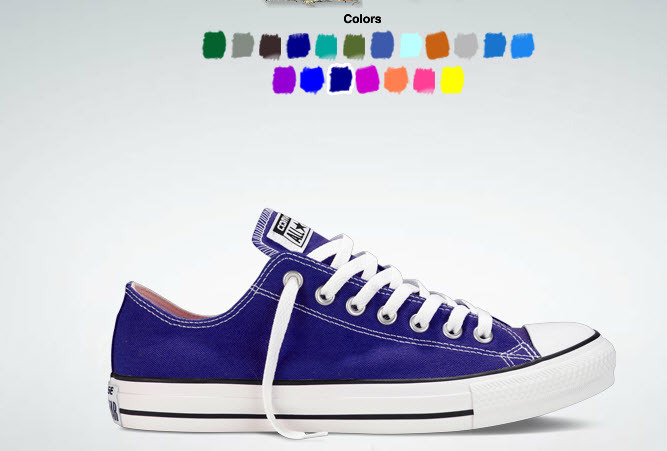 Isn’t this shoe so, so…PURPLE? I must confess, I’ve wanted a purple pair for a very long time, but always bought the more neutral flavors (beige, light brown, gray, hot pink, Kelly green–you know, neutral, LOL). But purple shoes? What on earth would I wear them with? There’s only so many times a girl can rock a black T-shirt and jeans. Then I decided…who cares! They’re PURPLE! And nothing makes a girl happy like a purple sneaker, right? What is it about sneakers that holds me in thrall? When I was in high school I had Keds™ in every color. All my babysitting money went to the newest pair of baby blue canvas tennis shoes. But yesterday’s purchase was a little more special. There was a reason behind the treat of new shoes. I’d set a few fairly lofty goals regarding writing/publishing over the last year, and I accomplished them both. It’s been an amazing year, and I’m going to wear my purple sneaks with pride, because they came out of some really hard work. What about you? Is there something you collect? Do you have a special item you treat yourself with when you accomplish a milestone? This entry was posted in Blog on July 19, 2013 by Kendra.